This was the headline of one of the principal newspapers in Chone on Monday, October 25th. 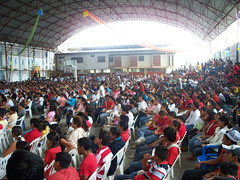 On Sunday, October 24th, we celebrated in Chone the Youth Day on a provincial level that about 1800 young people participated in. At the beginning they were only going to be 800, which are already quite a few, but at the last minute people began to call letting us know that more people had signed up. The sisters of Chone were in charge of this event. We had to take into account many different things, both spiritual and material. We began to go door to door soliciting people's generosity. This is how we were able to get what was necessary to be able to feed those young people: rice, chicken, drinks... And not just food...but also chairs, tables, tarps... The encounter, which we think was a great spiritual help for many, was possible thanks to the generosity of many different people. Everyone did all they could to help us, be it by giving us things, helping in the kitchen, moving chairs, etc. We must thank in a special way the effort that a group of ladies and girls made (losing hours of sleep) so that everything would be done on time. They worked hard and in an environment of joy and generosity. It was quite a challenge, but they met it. After all the preparations, the day that would go down in history arrived: Sunday, October 24, 2010. The young people arrived and Fr. Patricio welcomed them. 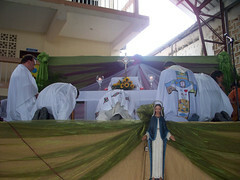 We had Mass celebrated by Fr. Manuel Cedeño, Pastoral Vicar for the diocese, who gave a very good homily. 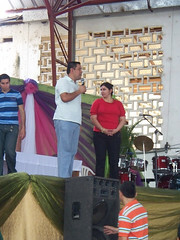 After a time of entertainment, Henry and Viviana gave their testimony. Meanwhile we (the sisters) took care of organizing the food situation. In less than an hour, we were able to orderly distribute 1,800 containers of chicken and rice, salad, a drink, etc. At 1:45pm, Archbishop Lorenzo Voltolini arrived and we had exposition of the Blessed Sacrament, which he himself led. He was accompanied by a group of priests and seminarians. It was the best part of the day. 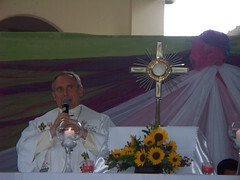 There was a respectful silence when the Archbishop placed the Blessed Sacrament on the table that was used as an altar. Archbishop Voltolini spoke to the youth, telling them that they had to discover the greatness of the Eucharist. 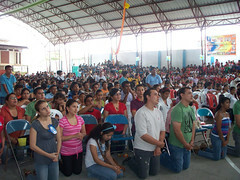 It was impressive to see most of the young people listening on their knees, in front of God. Afterwards, we had to say goodbye. We think that the young people went away very happy. We hope that all this effort has helped to bring the youth closer to the Lord. The group leaders were most thankful for the time in front of the Blessed Sacrament. This was a new element in the organization of the Youth Day. The Pastoral Vicar was very impressed and said that it would be a good thing to keep in mind in the following events. In the midst of all the craziness of so many people, and seeing that not all of the young people were aware of what they were going to attend, it was a crucial moment. It was the best moment to have an encounter with the Lord, which is what we had intended when we organized it. Let us give thanks to God!